Since our daughter isn’t coming home this year, I opted out of the traditional spending-all-day-in-the-kitchen meal. I am now feeling a little guilty about that decision, but neither my husband or son are complaining. Three days ago (Monday) I saw my first fresh-cut Christmas tree on someone’s car, a great reminder of what a lot of people will be doing this coming weekend! (As I get older, I don’t feel the rush to get the house decorated so soon)… My gosh, I’m becoming a slacker! No turkey today, and our Christmas tree won’t be up by this Sunday at 11:59 PM. Happy Thanksgiving to all of those who live in the States, and happy reading to all of you! I’d like to give thanks to you for creating and maintaining this wonderful website. Happy Thanksgiving! The weather here is not very fallish it will be in the upper 70’s today. Seasonal weather would be nice. I do the pies and green beans every year and the rest of my siblings bring sides as well . My dad who is 80 does the turkey and a ham. ( mom supervises ).Looking forward to lunch and coming back to the house to Maron’s new book Christmas Mourning. I know what you mean about the Christmas decorations, I was on my way home and a block from my house I noticed on Monday that some had a light up Santa and sleigh in the front yard! Let me eat my turkey first, please. Why does it seem that alot of people rush the holidays? I just want to savor them. I don’t do any big decorating – wreath on the door and something winterish on the table , but no tree. I have 2 cats and bless their hearts you haven’t lived until you see a 14lb cat in your tree go one way and the tree the other. It was really funny ,but I decided then no more trees. Danna, don’t feel guilty! After all the years you slaved over shopping, planning and cooking huge holiday meals to have them eaten in 20 minutes…..you deserve a break!!! And I NEVER put Christmas decorations up before Dec 10th or so, I like to let Thanksgiving be Thanksgiving and Christmas be Christmas. To HECK with each holiday starting way before the next one has even been enjoyed fully. It is a definite turnoff to me to see Christmas items out in the stores before Halloween even, let alone Thanksgiving! Am tired of it, and I don’t give in to it!!! So enjoy your simplified meal with your husband and son, catch up on the important things in your lives and make a new tradition. Happy Thanksgiving to you!! And closer to Dec 25th, I will send Holiday greetings!!!!!! I haven’t any family and I made a turkey last month so, today, I’m spending the day alone, in peace and quiet, watching the snow fall, browsing the internet in my recliner, with my cat lying on my chest and hugging my arm. I made taco preparations last night for easy pickings today and I have coffee and a homemade strawberry banana custard pie waiting at my beck and call. happy non-turkey day! our grown children went to their in-laws’ homes for t-day, and, as they will all be coming here on Saturday for turkey, my husband and I had gorgeous NY strip steaks for our day. (is it possible to wish for a bird rather than gorgeous steak? – yes! we would have gladly eaten turkey!) 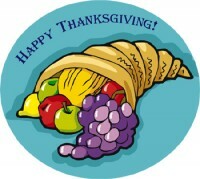 but we look forward to Thanksgiving here on Saturday and the all-day preps! Thanks, ALL, for the holiday greetings! There’s nothing BETTER than being a slacker during holidays! Enjoy yourself silly!! !